News and events for the month of November. This month's installment has a handful of items for you and your family. 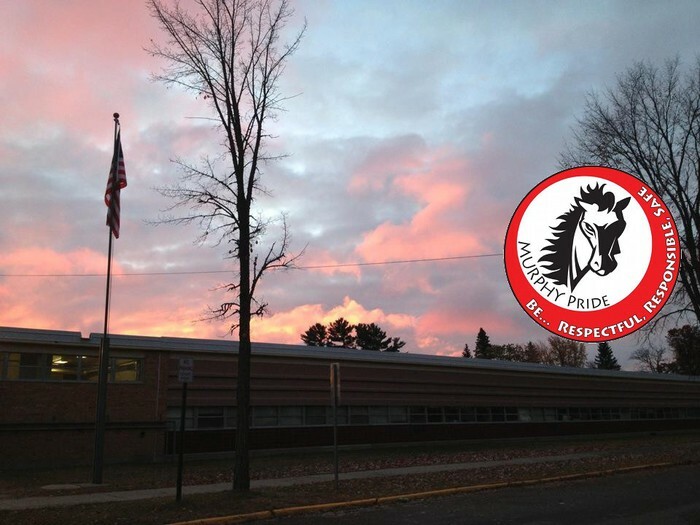 We hope you are staying healthy and warm and enjoying the start to the 2012-2013 school year! 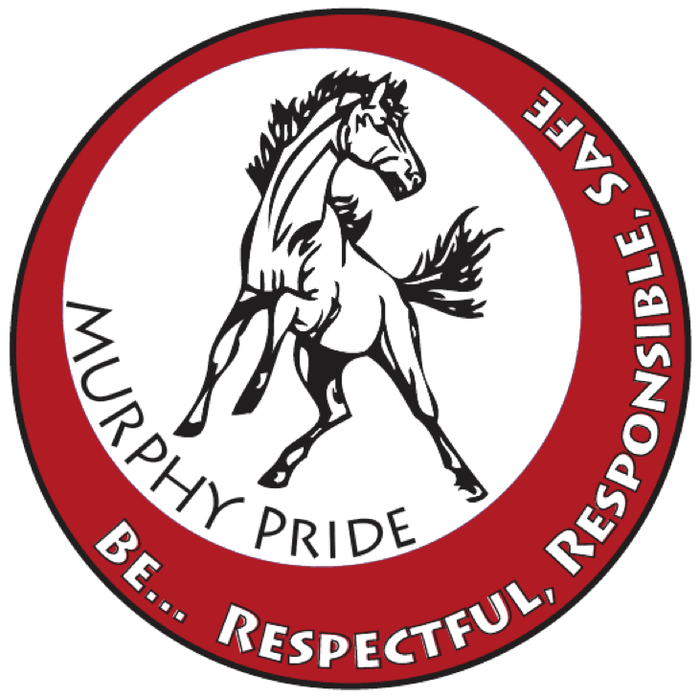 This school year brought many changes and updates for students at Murphy Elementary School. The school opens each morning at 7:40am and doors do not open until this time. The only door unlocked during the day is our West Entry which is outside the main office. 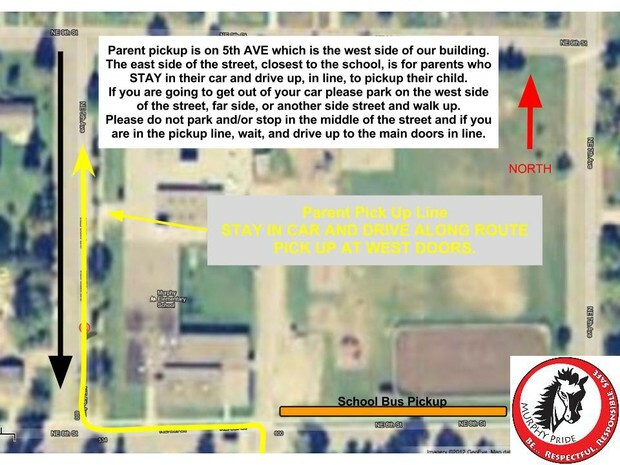 The area directly in front of these west doors is reserved for our school buses as they drop off students. Please drop your children off before or after this area. The area is visibly marked with cones and signs yet continues to be a concern for our buses and student when cars try to swing through and drop off right there. Morning recess and breakfast runs from 7:40 to 8:15. Students are not released to their classroom until 8:15. First bell rings at 8:25 and the late bell rings at 8:30. Our school day, announcements, and pledge start promptly at 8:30. We do announcements every day as close to the 8:30 bell as possible. Each student will get the chance to help with pledge, we start at 4th grade and work our way down to Kindergarten. Most will say the pledge, some choose not to and that’s okay, everyone gets a chance though. Morning announcements consist of: news items, lunch menu, AR reading update, and Pledge of Allegiance. 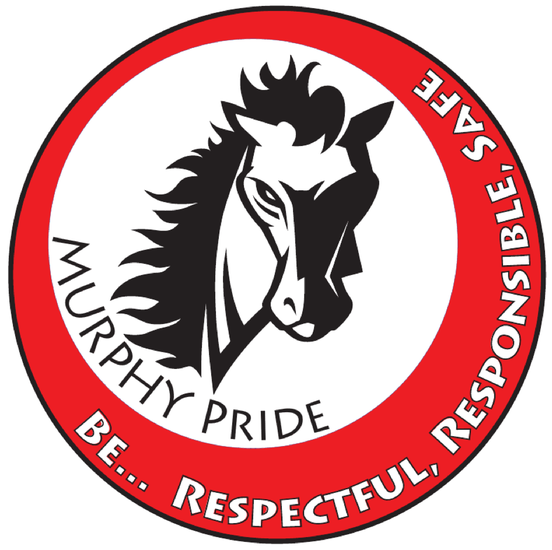 The 2012-2013 school year brought the addition of new staff at Murphy Elementary School. 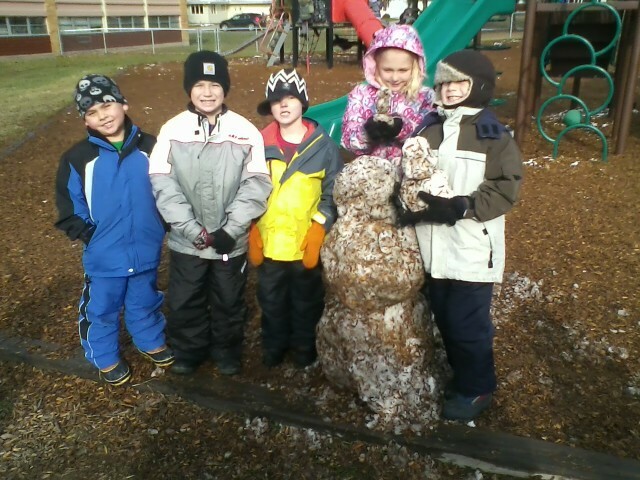 Starting Monday, October 29th for recess, all of our students (K-4) have been expected to wear the appropriate winter clothing including a hat, coat, gloves/mittens, snow pants, and boots. We can assist anyone that needs cold weather clothing, we need you to let us know. We will make sure our students are safe but for those that forget items (such as boots or snow pants) they will be required to stand along the outside wall. If the weather were too cold to be outside without the item they forget we would have them stay inside. We want kids to be safe and at the same time work on responsibility in remembering their clothing. If your family is in need of any cold weather items (boots, hats, mittens, snow pants, …) please let your child's teacher or the office know and we’ll figure something out. We do have grant funding available for items such as this and do an excellent job of sharing items without drawing attention to the kids. Children come to lunch hungrier and thirstier thus reducing waste. Less visits to the nurse's office, kids that play and then eat tend to have less "tummy aches" than those who eat and then go straight to recess. Children have time to eat, there's no need rush to finish lunch early as there is a set amount of time and students all leave at the same time to go back to class. Children are ready to learn, they've had time to run around and exercise, they've calmed down, had time to eat, and are relaxed and ready to learn. Along with recess before lunch we staggered who goes out. We have "three" recesses: Kindergarten, 1st & 2nd, and 3rd & 4th. 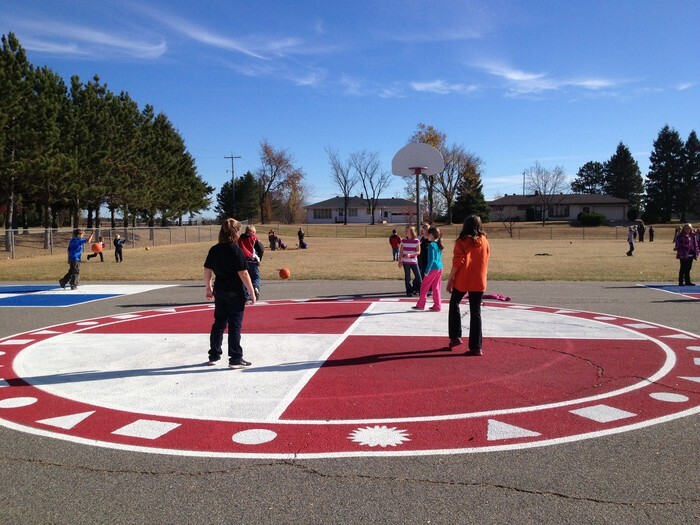 This helps us provide more activities for the kids when they are outside. 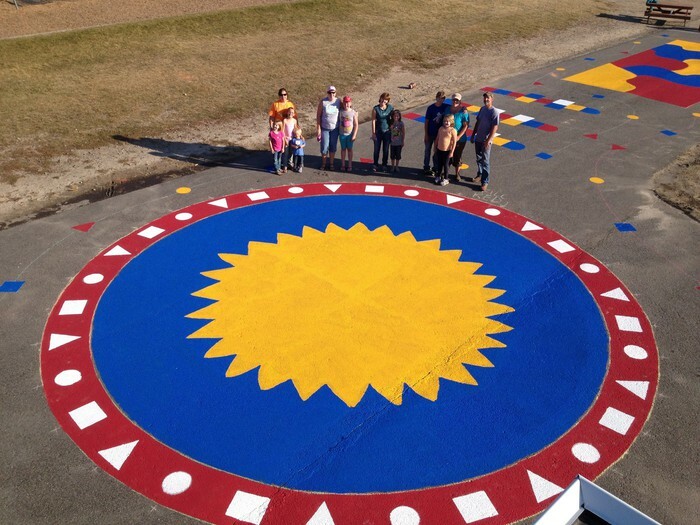 New activities and a new coat of paint! 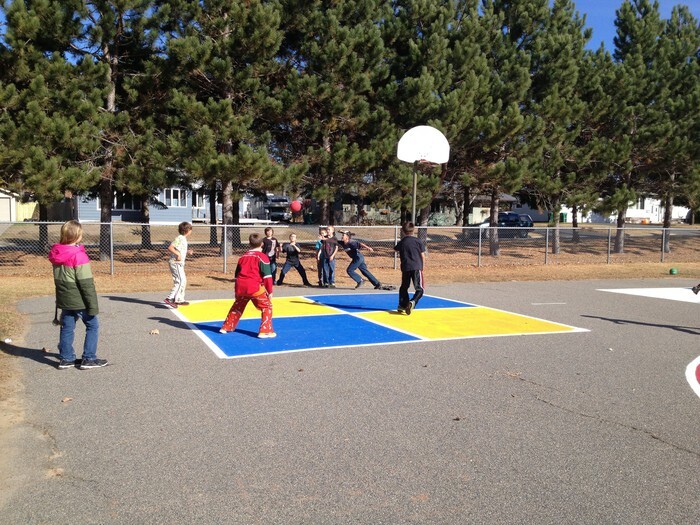 Nw board games for use in Gym and recess! AR, short for Accelerated Reader, is a reading program that tracks how many books, words, and points (based on book quizzes) students have accumulated throughout the year (grades 1-4). Students are assessed throughout the year so they know which level books are right at their Independent Reading Level. This program has a special feature called Renaissance Home Connect, which you and your child can access outside of school from any computer with an Internet connection. Renaissance Home Connect is fun and easy to use. It allows the teacher, you and your child to share information about your child’s progress in Accelerated Reader. View your child’s Progress and reading history. See your child’s reading level. Search for AR books at your child’s level. 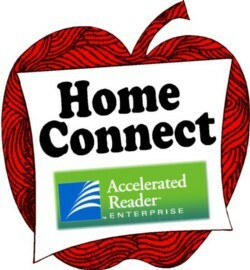 After you receive your login information, if you still have questions about Renaissance Home Connect, please speak with your child’s teacher or Mr. Martinson. 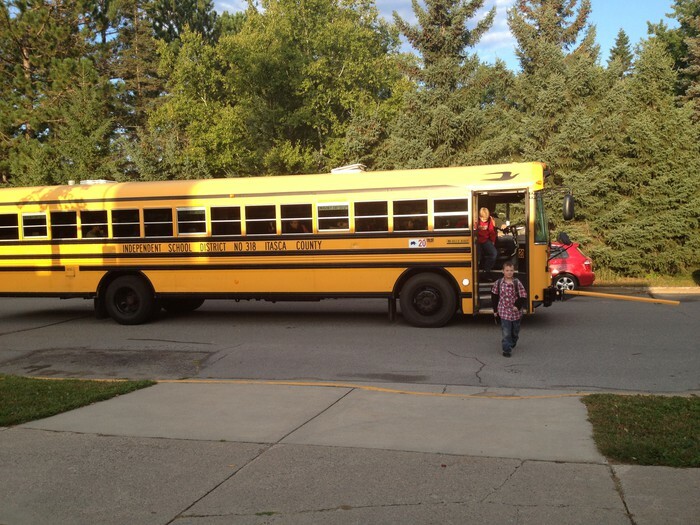 On Mondays, Tuesdays, Thursdays, and Fridays parent picks and bus loading starts at 2:50. Every Wednesday is an early release and pickup starts at 2:10. Curb side located closest to the school on the West and South ends are reserved for families that are going to stay in their car and pull up to pick up their child. If you are going to get out of your car and walk to the building, please park on a street across from the school building. Again, the curb closet to the building on the West and South sides are for families driving up and picking up. 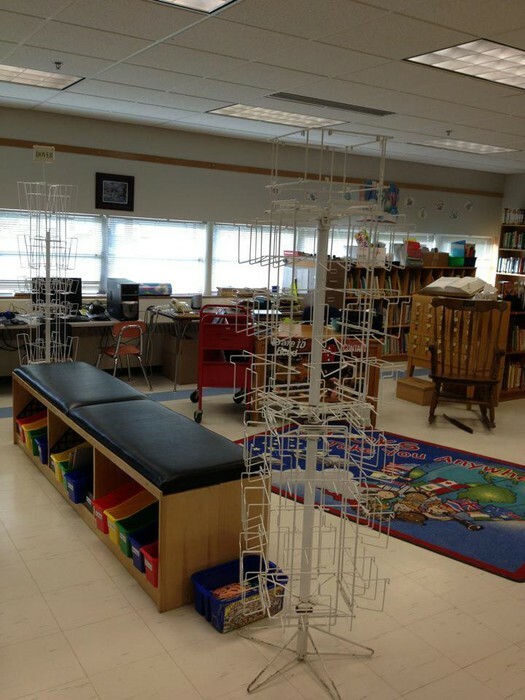 The Responsive Classroom approach is a widely used, research-based approach to elementary education that increases academic achievement, decreases problem behaviors, improves social skills, and leads to more high-quality instruction. 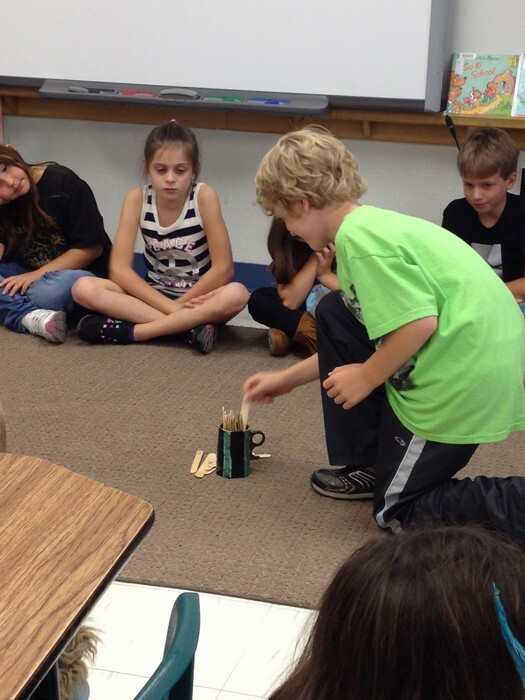 The approach includes practices such as: Morning Meetings, Rule Creation, Positive Teacher Language, and more. These rules may look different in different areas, yet the three hold true everywhere: Be Respectful, Responsible, and Safe. 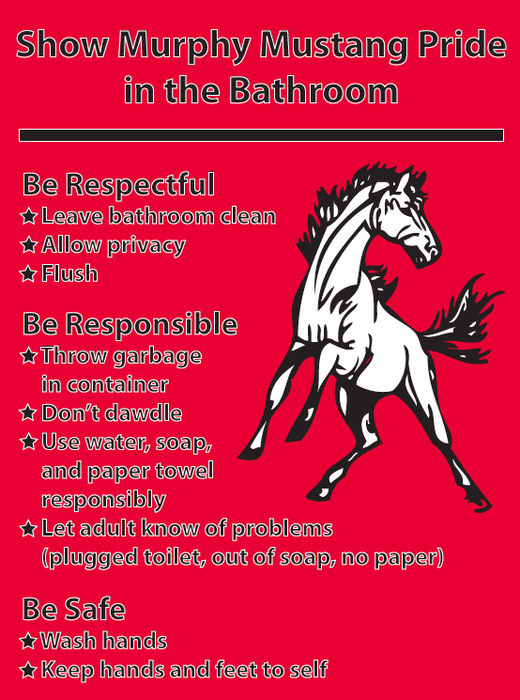 Be Respectful, Responsible, and Safe in the bathroom. 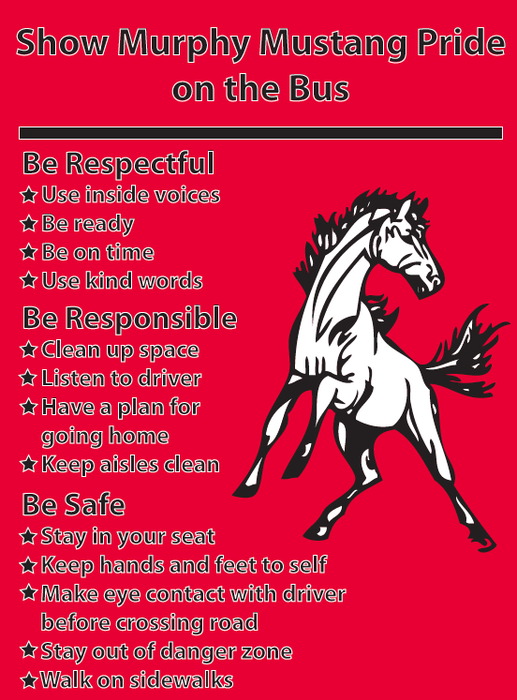 Be Respectful, Responsible, and Safe on the bus. 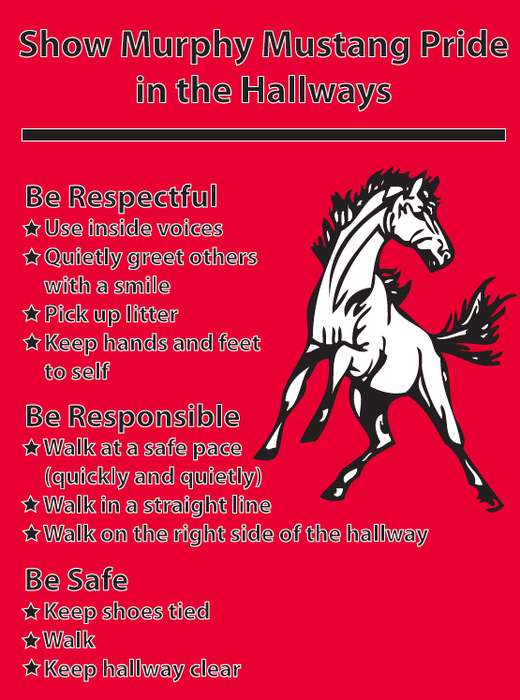 Be Respectful, Responsible, and Safe in the hallway. 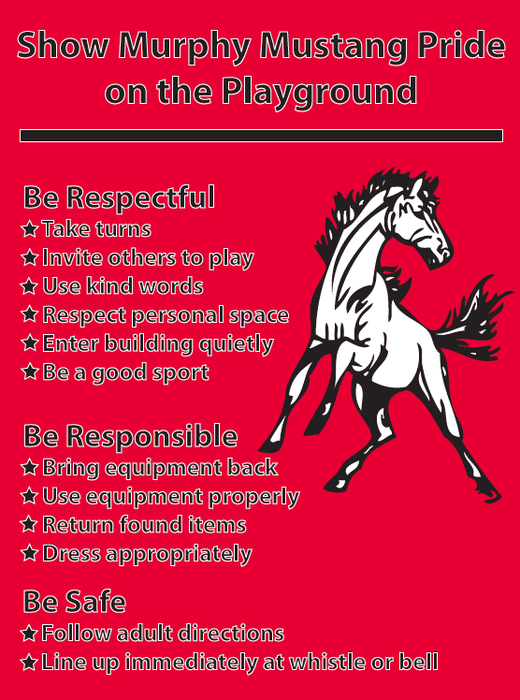 Be Respectful, Responsible, and Safe on the playground. 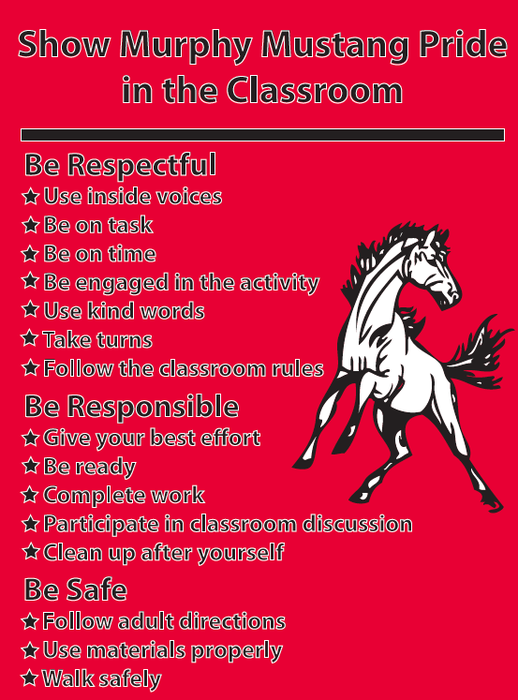 Be Respectful, Responsible, and Safe in the classroom. 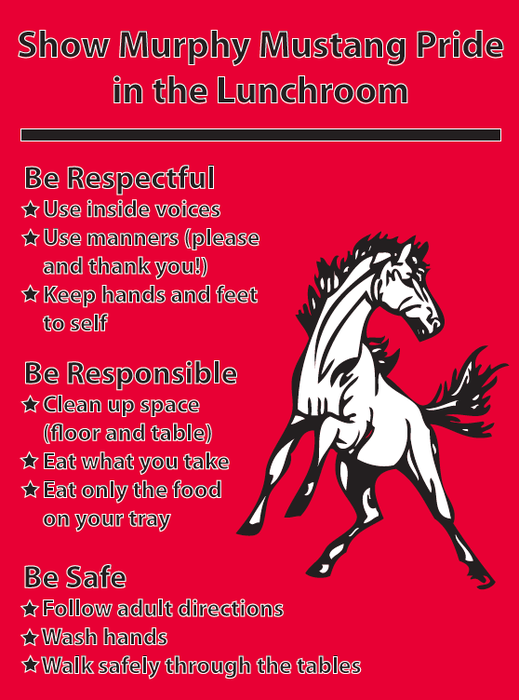 Be Respectful, Responsible, and Safe in the lunchroom. Over the past few months we’ve been working on the specific school rules of Be Safe, Be Respectful, and Be Responsible. Something that we’ve added for this year is that we’ll use a different tool to recognize social skills. This year we will utilize “Mustang Medallions” to recognize positive behavior and this could be any positive behavior and isn’t limited to a certain skill of the month. You may have hear about the medallions or even seen one come home. Each staff member is given a set amount of coins and when they “catch” a kid being good we may sneak them a Mustang Medallion. 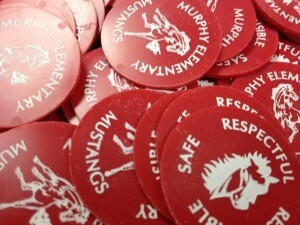 The purpose of this tool (Mustang Medallion) is to recognize and catch kids being good. We want to avoid having kids expect to get something for an action yet at the same time recognize those that go above and beyond. You don’t have to look too long before you catch kids doing something downright awesome! When one of our kids receives a coin they can save it to be used at the school store, which is starting next week, or to buy popcorn on popcorn days. Some of the kids are even planning to collect and save them instead, that I didn’t expect. I hope you have a great month and that your family stays healthy. I hope to see you at conferences in November. Most parents don’t realize that Federal Education Dollars (Title I) are directly tied to the number of children who qualify for free or reduced lunch and that this year’s numbers are used to determine eligibility for next year’s program. Parent involvement activities and MUCH more! By filling out a FREE AND REDUCED LUNCH APPLICATION form, your family could help qualify our school for more Federal Education dollars! Your child DOES NOT have to eat hot lunch at school. Your child DOES NOT have to received Title I services. This is the ONLY way schools can qualify for Federal Funds for students who need extra help and support and also helps to reduce the overall cost of staff. Also, if you need help filling out the form (it can be confusing) or if you have questions, please feel free to contact me or our Food and Nutrition Department ( 327-5771). 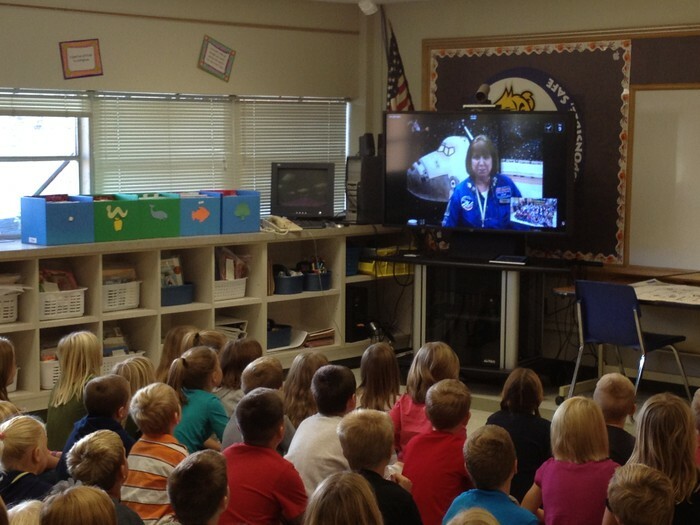 This year all schools in the Itasca region installed "Telepresence Studio" carts in their elementary schools. The studio can be used in many ways to video conference. With this tool we can: connect to other IASC buildings, partner classes, presentations, virtual field trips, professional development, and more! 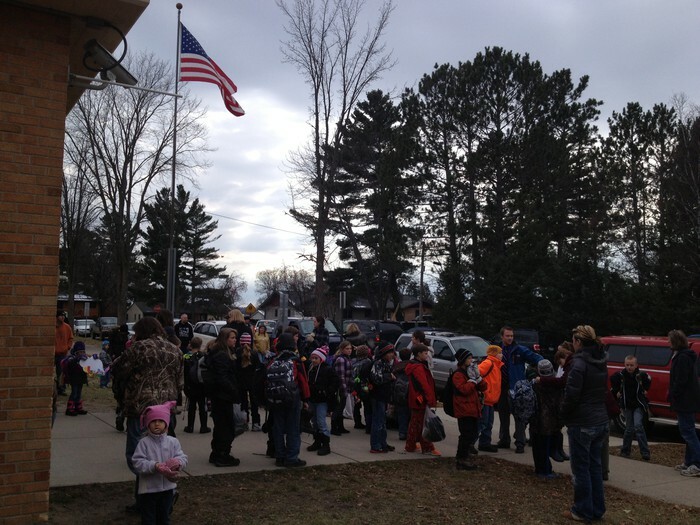 The picture included with this article shows an offering that was held at Cohasset Elementary School. Their 2nd grade students had a presentation on life as an Astronaut. The speaker was from the Challenger Center in Indiana. Along with Cohasset, Forest Lake, and Southwest, our media center will be going online this school year. Using Alexandria library software we will be cataloging our entire collection and students will be able to checkout books in a much more efficient manner. Students will still need to understand the Dewey Decimal System, however, they will be able to quickly search the entire collection by author, title, subject, or series. 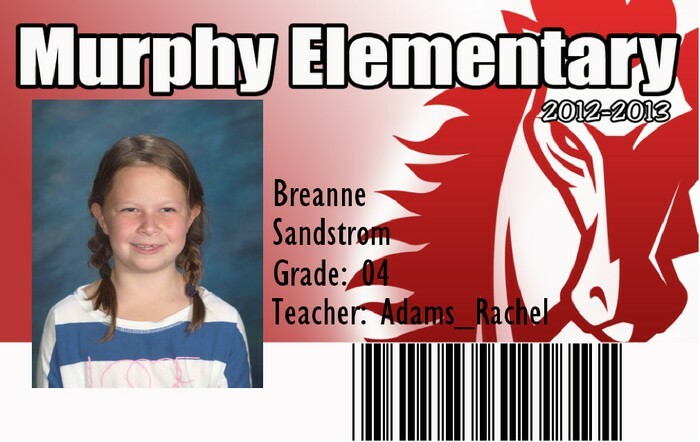 The picture included with this article is a sample of the student ID cards we will be using (not a Murphy student or teacher on the card). We will be holding a Book Fair each night of conferences (11/13, 15, 19, &20). Books from Scholastic will be available for purchase each of these nights. A Big Mustang THANK YOU! Thank you to the following for their help with different projects at Murphy Elementary School! 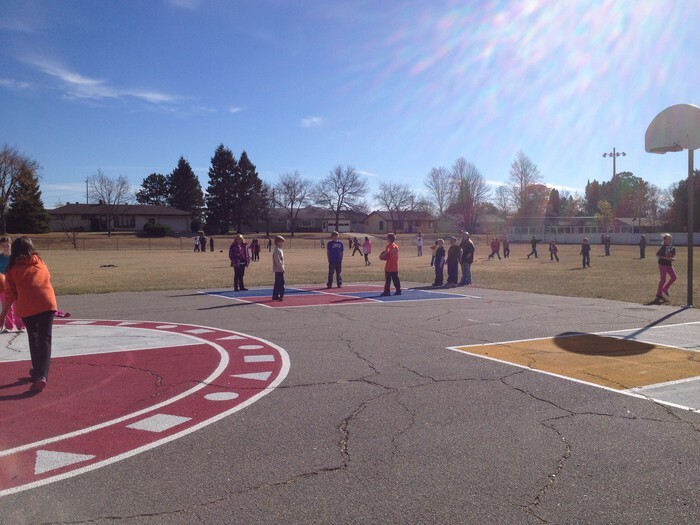 Thank you to the many hands that helped to paint our playground! At the risk of missing anyone here's a list of our helpers.... Nancy Schlader and family, Heather and Ashley Wilson, Paul Zimmerman, The Hills (Debbie, Donna, and Emily), Beth and Addison George, Sonja Hanson, and the City of Grand Rapids. No school either of these two days. Tuesday 11/6 is a staff day, no students. Fundraising orders will be delivered. Please remember to pick up your order! 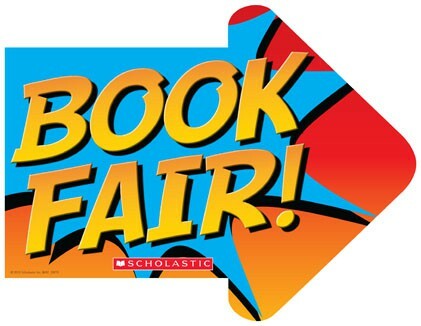 The Scholastic Book Fair will also take place should you choose to purchase any books. PTC meeting to be held in Media Center. Enter from the main doors (west entry). The Mission of Murphy Elementary is to ensure that all students acquire knowledge, skills and attitudes necessary to realize their potential and become productive and responsible citizens of a changing world.